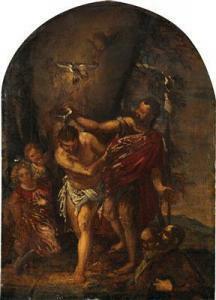 Find artworks, auction results, sale prices and pictures of Paolo Veronese at auctions worldwide. Provenance: probably Giovanni (Jan) Rienst collection, Venice, before 1646; probably Gerard Reynst collection, Amsterdam after 1646; Private collection, Zurich, circa 1991; Private European collection Literature: probably C. Ridolfi, Meraviglie dell´Árte, 1648, ed. by D. von Hadeln, vol I, Berlin 1914, p. 340; T. Pignatti, F. Pedrocco, Veronese. Catalogo completo, Florence 1991, p. 325, n. 263 (as Paolo Veronese); T. Pignatti, F. Pedrocco, Veronese, Milan 1995, vol. II, p. 499-500, n. 401 (as Paolo Veronese). 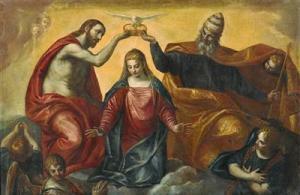 We are grateful to Mauro Lucco for confirming the attribution and his help in cataloguing the present painting. The present painting is almost certainly the painting mentioned by Ridolfi in his biography of Veronese (see literature) where it is recorded in the collection of Giovanni Reynst in Venice. 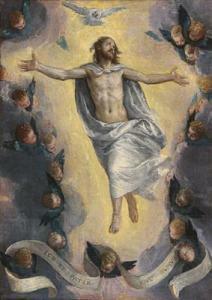 There was \“a risen Saviour, a small picture, shown wrapped in a linen drape, surrounded by a crown of flying spirits, with an inscription held by some of them, which reads: Ego et pater unum sumus (I and the Father are one); for which he intends many gems of inestimable value\’\’\’\’\’\’\’\’ \‘Salvatore risorto in picciolo quadro involto in un panno lino, à cui fan corona molti spiritelli volanti, con un breve sostenuto da alcuni di loro con l\’\’\’\’\’\’\’\’ali iscritto: \“Ego & pater unum sumus\”; che si pon dire tante geme d\’\’\’\’\’\’\’\’inestimabil valore\’\’\’\’\’\’\’\’. Giovanni, or rather Jan, Reynst was a successful merchant. He was originally from Amsterdam where he was born in 1601, and he settled in Venice in 1625. Before 1633 he attained the monopoly on commerce in salt between Spain and Lombardy via Venice, thereby circumventing the Genoese. In the meantime, he had also begun to form an important collection of old master and contemporary paintings. The dedication letter of Ridolfi\’\’\’\’\’\’\’\’s Meraviglie dell\’\’\’\’\’\’\’\’Arte is dated 25th June 1646: evidently the volume was offered to a patron who was as important for his connections in the international art market as for those in trade. Indeed the author allows us to understand that a second and equally important art collection belonged to the patron\’\’\’\’\’\’\’\’s brother, Gerard Reynst in Amsterdam. Jan Reynst died unexpectedly on 26th July 1646, and his brother in Holland inherited his whole collection; however, twelve years later Gerard also died and consequently the whole collection was dispersed over the next fifteen years. Documentation does not provide further information about when the present painting was sold. At the time of von Hadeln\’\’\’\’\’\’\’\’s commentary on Ridolfi\’\’\’\’\’\’\’\’s text in 1914, the painting was believed lost, as it also was at the time of Teresio Pignatti\’\’\’\’\’\’\’\’s monograph on Veronese in 1976 (see: T. Pignatti, Veronese, Milan 1976, vol. I, p. 232; and 2nd edition with F. Pedrocco, Veronese, Milan 1995, vol. I, p. 499, tav. 401). However, the present small canvas only re-emerged from a Swiss private collection at the end of the 1980s, and it was then recorded by Pedrocco in his monograph on the artist (see: F. Pedrocco, Veronese. Catalogo completo dei dipinti, Florence 1991, p. 325, tav. 263). He specifically identified the picture as probably the one recorded by Ridolfi. It seems logical that the 17th century text specifically cites the text from the Gospel according to John (17:22): \‘Ego & pater unum sumus\’\’\’\’\’\’\’\’, which is extremely rare in the visual arts, and has seemingly never been used previously in relation to the resurrection. Moreover, Ridolfi\’\’\’\’\’\’\’\’s description perfectly records what is represented in the present painting. The composition appears to closely relate to the Resurrection of Christ in the Hermitage, Saint Petersburg (inv. 2545), as well as the painting in the Gemäldegalerie, Dresden (inv. 235) where Christ is shown enclosed by a luminous mandorla, wrapped in an ample fluttering mantle with his arms parted to form a cross. Both are works that belong to the early 1570s. However, the present work´s overall composition is formally less compact: the brush strokes, textures and gesture appear looser, as characterised by his work of the 1580s, where less importance is given to those qualities of strict volumetric definition that had prevailed previously. In Lucco´s opinion Pedrocco (see literature) was correct in comparing the present work to the Resurrection at Westminster Hospital, London and the altarpiece at San Francesco della Vigna, Venice, thereby dating the present work to Veronese\’\’\’\’\’\’\’\’s final years. Paolo Veronese - A Sibyl. Black chalk, heightened with white, on blue laid paper. 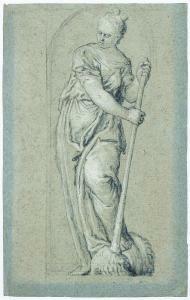 20.5 x 13.5 cm. Framed.